The Research Center for the Americas invites you to join us as we celebrate International Women's Day with book talks by two leading feminist scholars on Thursday, February 28, 2019 at the Merrill Cultural Center. 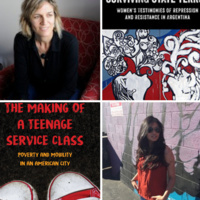 The first speaker is Dr. Ranita Ray of the University of Nevada, Las Vegas who will speak about her book The Making of a Teenage Service Class: Poverty and Mobility in an American City (University of California Press, 2017). The second speaker is Dr. Barbara Sutton of the University of Albany, SUNY who will speak about her book Surviving State Terror: Women's Testimonies of Repression and Resistance in Argentina (New York University Press, 2018). Together, these books explore the critical themes of resistance, survival, intersectionality, and trauma/hardships in the Americas.